at listings below if your dates are not available here. Right in the heart and excitement of Waikiki or on the serenity of the Beach at our Turtle Cove property. WaikikiLux has got you covered!!!! Be it our side by side suites right in the heart of Waikiki or our one bedroom suite on the beach at Turtle Cove. DO ONE / DO BOTH, Design your own vacation and experience the best of both worlds of Hawaii. Traveling together with family, friends or business associates, our side by side Suites in Waikiki are prefect, Right in the heart of Waikiki, with everything you need just outside your door. If serenity is in your plans, Turtle Cove what we like to call 'our little secret' is the place, where the biggest decision of the day could be the pool or the beach. No matter what your taste WaikikiLux has got you covered. Fabulous Suites, Great Locations, Reasonably Priced & Choices! As always at the Lux, all amenities are included: First Class Fully Equipped Kitchens, 32 inch LCD TV's, Surround Sound w/CD,DVD,IPod,AM/FM, H/S Wireless Internet, Free Mainland, Canadian, InterIsland Directory Phone Service, Fabulous Queen Beds, Luxurious Linens, Beach Towels, Beautiful Baths, Hair Dryer, Iron/Board, Vacuum, KeyLess Entry, Lanai, Adjustable Lighting, Ceiling Fan, AC, Pool, Parking and Apple TV at Turtle Cove, all you will need are your clothes. Be it Town or Beach or how about a little bit of Both. Let WaikikiLux make that ultimate Hawaiian GetAway happen!!! Amenities vary with property, inquire for more details on a specific property. GREAT! Awesome location, secure, clean and tastefully decorated. We absolutely loved the location of this condo studio. Did not mind the short walk to beach. Surrounded by amazing places to eat. Very pleased this place is clean and comforting, smells nice, tastefully decorated. Full kitchen equipped with all necessities. This condo was fabulous! 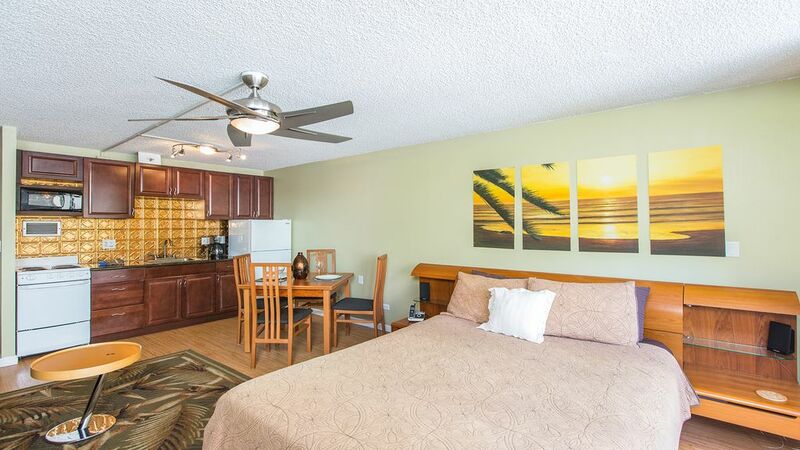 It is a convenient location and close to shopping, restaurants, and Waikiki Beach. It was spacious and perfect for my husband and I but could definitely work for a smaller family as well due to the additional couch available. There were plenty of towels for use in the condo and extras to take to the beach. Kitchen was stocked with plenty of dishes and small electronics if you want to enjoy cooking in the unit. The building security was very nice (have to use fob to access the main door after hours and use elevator during all times). Bobber was VERY accommodating and answered all of my questions in a timely manner before our stay. We were especially grateful because he let us have a late checkout which just shows you how great an owner he is. Would definitely recommend this place to anyone! The condo was centrally located, had good amenities, was clean and quiet, and had mostly modern updates. "Pat" the evening building security guard was very friendly and helpful when we arrived. The bed was comfortable and the lanai offered a good view. I used the beach umbrella and a couple of the beach towels on Waikiki beach. The swimming pool one floor below on the roof was relaxing and somewhat private. During our 4 night stay, one of the two building elevators was shut down which caused some lengthy waits when times were busy (no fault of the owner). The air conditioner worked well but we had to prop a chair against the drapes to close a gap to prevent the morning sun from coming in. A two inch horizontal extension on the end of one drape would fix the latter issue. An extra electrical extension cord on the window side of the bed would have been helpful for charging my wife's cell phone. The bathroom didn't have an exhaust fan which resulted in high moisture when taking a shower. The owner might consider having one installed. All things considered, a good property. We had a great time. Perfect for traveling with kids. Fridge and microwave are a huge help. Room was clean, well set up and within walking distance of shopping, dining and most importantly the beach! Mahalo for staying with us we look forward to seeing you again. Was not sure what to expect. This was my first VRBO rental. It was great. Clean, well located, nicely appointed. Bobber is a nice guy too. We will stay again! WaikikiLux offers you a choice, be it Waikiki or the Serenity of the Beach at Turtle Cove in Makaha West Oahu, or do a little bit of Both For that Ultimate Hawaiian Vacation. Golf: World calss golfing all over the Island.